It is safe to say that The Hackers Paradise is fond of the equipment that the SeeMore Putters company has put out over the past couple of years. Just in the last few months we have had the opportunity to review the m8 putter and were literally blown away by the looks, feel, and performance of this flatstick. 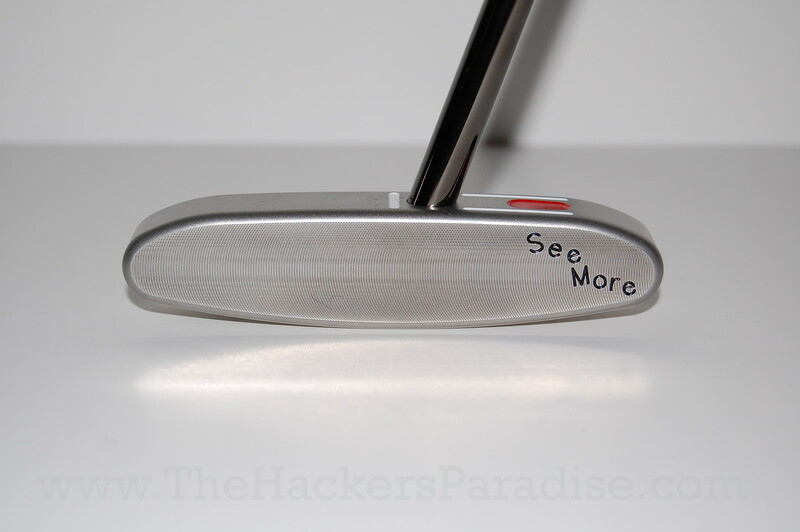 THP followed that review up with a look into something a little different from SeeMore Putters in the form of the DB-4 in which we felt as though the company was adding something that would be a mainstay in their stable of equipment. Then just a couple of weeks ago we took a look at the new m7 and thought that they had come up with a solution for many golfers that wanted a traditional shape, but still the original RST all wrapped up in a putter that is simply beautifully crafted. 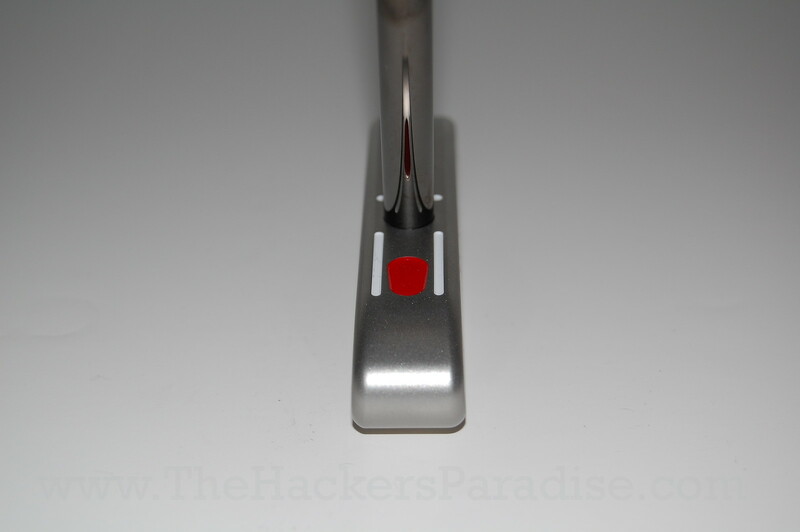 Now THP has been given the opportunity to review a new putter from them in the form of the m6, and I must say the word that comes to mind when you see the pictures is simply “Really?”. Click on pictures for larger hi-res images. The m6 is a classic 2-way blade putter, a throw back design to the great putters of the past. Alignment benefits of RifleScope Technology (RST). Full toe hang – straight down. 100% milled 303 stainless steel. Platinum finish. When the package arrived, I must say that I was expecting a little more. But the beauty of this one lies in the simplicity of the package that they have created. Small, thin, sleek, and classic make the SeeMore m6 come to life as a blast from the historic past. When it first arrived, we put some pictures up in the THP forum and you can see what the forum members had to say about this one here. The group at THP headquarters had mixed feelings on it with some exclaiming that is the best putter they have seen, while others said “it looks like a miniature golf putter”. But one thing is for sure, nobody was questioning the RST and whether or not it works. The patented RST, known by a visible gun sight on the top line, allows the golfer to set up the putter perfectly each and every time in relation to the intended target line. This is accomplished by lining up the black bottom portion of the shaft between two white lines and covering a signature red dot on the heel of the top line. The two parallel white sight lines frame the shaft and serve as an indicator that the golfer is in perfect position to make a consistent and reliable stroke. One thing can be said about the SeeMore m6 putter before we even get into the feel and performance side of things and that is, that this model is not going to be for everybody. The classic and simplistic design is designed for a specific player and if you fit into that mold and crave this look, I am not sure we have ever felt something quite like this. 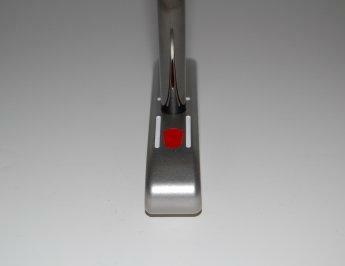 Let me start out by saying that despite the basic appearance, this putter feels fantastic. Soft, supple, plush, and “meaty” upon impact makes you wonder where the depth is coming from when putting with it. The classic design provides a top line view that makes many envious in the market and yet you still get the feel that one would expect with a more modern shape. Each person that lined it up came back and said something along the lines of “Whoa, I like this!”. In some ways the SeeMore m6 is a throwback and in other ways it appears to be a modern marvel. Like the feel, the performance of the SeeMore m6 was something different than what we originally expected. With buzz words such as MOI, heavy weighting, etc… thrown around right now in the world of putters, it is not common to come across something quite like this being released. One of the issues we have always had with thin putters like this of the classic variety is keeping steady throughout the putter stroke. The SeeMore m6 has the answer for that in the form of RST and keeping the red dot hidden does in fact keep your stroke steady and on the proper path through impact. It really made a huge difference for just about everybody that was working with it and became the perfect blend of performance and design that we had not seen before. Will the m6 make you putt better? Yes and no! 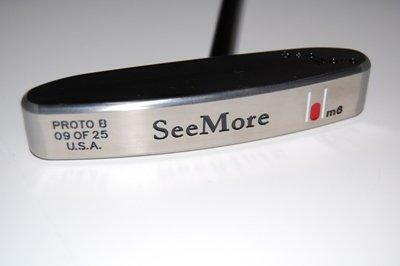 The SeeMore m6 like all SeeMore putters, I believe will make people a better putter. The RST found in their entire lineup increase the performance and help you make more putts. That part we have seen over and over again. The m6 feels tremendous and unlike any other piece of equipment that shares a similar look. I still preferred a few other models such as the m7 we reviewed last month, but that opinion is based solely on looks and nothing more. Adding RST to a classic design is not something new for the folks at SeeMore, but to do it in a way that works this well and has this kind of feel is not something you see very often. Lining up this against a classic Bulls Eye putter left us wondering why this had not been done before. 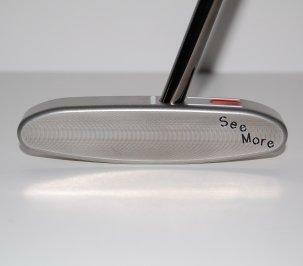 The SeeMore m6 made the Bulls Eye look foolish in comparing putts from 15 feet and the feel made the Bulls eye appear to be a toy in comparison. If you are a golfer that loves the design of this one, we strongly urge you to check it out. You can find out more about the entire SeeMore lineup at their website at www.seemore.com or their blog at www.seemoreputtersblog.com. I am capable of putting righty or lefty and if I ever decide to pull the trigger on it full time, this will be my putter. There are not too many 2-way putters out there anymore, and from my searching this one has the best look. This is one of the few SeeMores I did not try at the outing. I wish I had but there was so much to check out. It looks nice but I’ve never really played two way putters. Man I just don’t know. The look certainly is not for me, but I do know a lot of people who love the old Bulls Eye so this would be great for them. Thanks for the review! The style doesn’t suit me, but I have found the Rifle Scope Technology and the Seemore approach to putting to be wonderful. I have always thought of putts being straight. I have a straight line to a point at which the putt will break in the direction of the hole. My problem was hitting that point consistently. Using a Seemore putter allows me to pick my line and point and then set up consistently so that each putt has a higher chance of hitting that point consistently. I may make or miss a putt (for a number of reasons), but I am consistent with my aim, leaving me very easy to make second putts if the first doesn’t go in. Now I just need to find the right Seemore putter for me! I came through Franklin last year with a friend on the way to a golf vacation in Alabama. I have been playing Seemores for a couple of years and had to stop at the headquarters. 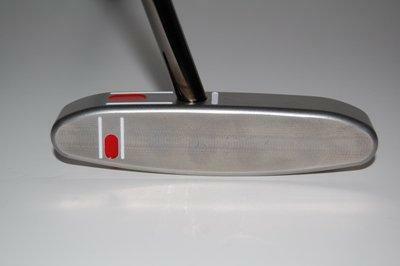 My friend Mike has been hitting an old Ping Anser for years and is a fantastic putter. He wasn’t overly impressed with the Seemores on hand until they handed him what is now the M6. He then drained 9 out of 10 of then next putts and claimed it to be the best feeling putter he has ever rolled. He probably would have bought it on the spot but it wasn’t for sale yet. The M6 doesn’t look like much but it is a great flatstick.